Mac OS X 10.4 (Tiger) officially ships today, and the first Macs to ship with Tiger installed are the speed-bumped 2005 Power Mac G5s. In addition to increased CPU speed, the new models have 16x SuperDrive and Radeon 9600 video is standard on the two slower models. The top-end 2.7 GHz model comes with Radeon 9650 and 256 MB of video memory. The entry-level dual 2.0 GHz model retails for $1,999, the midrange 2.3 GHz for $2,499, and the high-end 2.7 GHz for $2,999. "Looking for an affordable way to get an introduction to Apple's advanced and elegant operating system - OS X, or perhaps a cheap second computer for the family room or for the kids room? The Mac Mini may be perfect for you, if you have the right expectations and tasks in mind for the newest member of Apple's Mac lineup." PR: Hit-Up application gets your computer uptime on your Mac OS X and sends information to this website - the challenge is "I never restart my Macintosh!" Your computer must be a workstation or server. You must specify category in account creation. if you do not send your results during two days, you disappear from the list of participants. This system is controlled by a human being; it is useless to cheat. Download the application, open an account, and take up the challenge. Join the HitUp iChat community, discuss about HitUp on iChat. To reach the discussion type command G in iChat application and enter hitup. Hitup application records the time spent on your machine without restarting and informs a website with classification. This version is Tiger compatible and option added to display Hit-Up in iChat Status. "The Mac mini comes with a great gift, the Mac OS X Panther suite of intuitive excellent multi media incredibly linked and responsive software and the advanced Apple OS X Tiger will soon be available. "The software is the other amazing part of the Mac mini package and to use this suite of software is to experience the workability of a powerful desktop multi media system. "The Mac mini can be updated through software and with many new accessories. Excellent articles and commentary may be found on 123Macmini.com and this site is not just informative but fun for Mac mini aficionado's and anyone who truly is contemplating acquiring a Mac mini and experiencing the amazing multi media experience that comes with this little iAppliance because the ground has been walked before and help is handy." "In a previous article titled, 'Mac mini using a 3.5" Drive on the Internal IDE' I showed you how the Mac mini can perform considerably faster using regular 3.5" hard drives. In that article I used Adam Eberbach's 2.5"->3.5" IDE adapter to attach a 3.5" 160 GB Maxtor hard drive to the Mac mini and compared its performance to the Mac mini 1.42 GHz 2.5" 80 GB stock hard drive. While the Combo drive was removed in my previous tests you can also leave it connected if you still want to use the slim DVD/CD combo drive that comes with a stock Mac mini. I have found slim DVR's to be quite a bit slower than a standard 5.25" DVR and they are more expensive. "In this article I will show you how to recycle an old Apple Centris 660 computer into a drive dock for your Mac mini. If the looks and size of your Mac mini are more important to you than its performance this dock may not be for you. 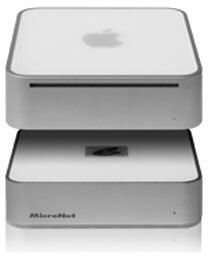 For myself, I find the performance increases and the upgrade savings of using the Mac mini Centris Drive Dock very nice. The Mac mini has a great processor and a fast ATA/100 bus that can perform much better with standard desktop drives." PR: So you got your new, stylish computer from Apple, and together with iLife you embark on your new calling as a digital media producer. With USB and FireWire audio and video input and ouput devices, printers and scanners, you may find yourself running out of ports- and running out of space to store all your creations. Enter the miniMate, MicroNet's new external disk drive and port replicator created specifically to complement Apple's new Mac mini computers. With available storage up to 400 GB, 4 USB 2.0 ports and 3 FireWire ports, the miniMate extends the capabilities of your new Mac to match the most capable workstations, all in a stylish aluminum and plastic enclosure that perfectly complements your computer. 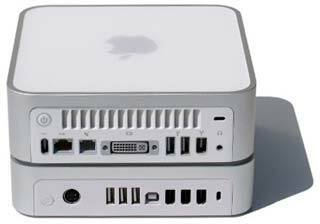 Although miniMate was created with Apple's Mac Mini in mind, miniMate will work with most Macs and PCs. The miniMate is created specifically to complement Apple's new Mac Mini. With available storage up to 400 GB, 4 USB 2.0 ports and 3 FireWire ports, the miniMate extends the capabilities of your new Mac to match the most capable workstations, all in a stylish aluminum and plastic enclosure that perfectly complements Apple's Mac Mini! Up to 400 GB additional storage - miniMate is available in the following configurations: 80 GB, 160 GB, 250 GB, 400 GB. Attach power, USB and FireWire cable and you're ready to rock. Cables included are: 1 x 7" Firewire Cable, 1 x 9" USB 2.0 Cable. 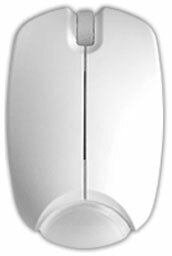 PR: RadTech has announced immediate availability of the BT510 mid-size, three-button, optical scrolling Bluetooth mouse. With electronically reversible left-right buttons and backup USB power umbilical, it's the right click for left-handed people! Sleek, versatile, and feature-rich, it's the right Bluetooth mouse for everyone. The BT-510 touts a comfortable mid-sized form factor - perfect for the desktop or on the road. Three button control plus scroll wheel makes navigating your workspace a breeze. 800 dpi optical resolution and ultra-precise tracking make it especially attractive to engineering and design professionals. And, connecting the BT-510 is simple - no drivers needed for Mac OS X. To ensure maximum battery life, the BT-510's smart, power-saving sleep mode conserves power when idle, and an easily accessible power switch allows it to be powered down when not in use. The BT-510 can also be powered via any USB port using its included power cable - so you always have the option of conserving battery life with direct power or using it as a back up to keep you up and running when batteries are low. As a bonus, the BT-510 is available as a bundle with the RadPak Travel case - a compact, semi-rigid clamshell case featuring a cushioned interior, twin rubber-tabbed zipper pulls and internal bays to accommodate a spare set of batteries. The BT-510 Bluetooth mouse is available in gloss black or white for $59.95 or bundled with the RadPak Travel case for $69.95. PR: The Kinesis MiniType keyboard doesn't sacrifice size for comfort. Full size keycaps are integrated with a scissors (notebook style) key switch. A vast improvement over traditional membrane key switches, the MiniType switches are silent, tactile and comfortable. The elegant, aluminum ultra-thin design makes it ideal for your laptop, serving as an ergonomic alternative to typing on your laptop's integrated keyboard. 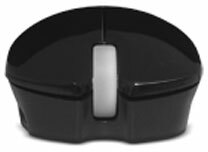 Use the MiniType where space is a premium or where you want to eliminate excessive reach to other input devices. Multi Media Features: Included driver supports special buttons for Email, Browser and My Computer for Windows operating systems. Driver not required for XP. 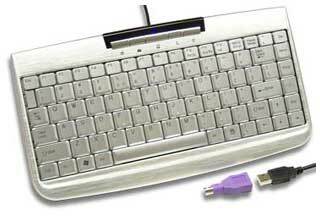 Kinesis MiniType USB-PS/2 Keyboard sells for $39.95. PR: Miglia Technology, a leading manufacturer of video, audio and storage products for Mac and Windows, today announced the immediate availability of a new version of MediaBank HS-R.
MediaBank HS-R now sports a high-speed Oxford 912-based FireWire 800 interface to increase the data transfer rates. Furthermore, the power supply unit has been upgraded to cope with the larger and more power-hungry drives appearing on the market. Eric Ferraz, Product Marketing Director, Miglia Technology, commented: "MediaBank HS-R has been an incredible success for the company since its launch. Many small businesses rely on MediaBank HS-R as a combined storage and automatic back up solution. The new MediaBank HS-R model offers even greater security, performance and reliability. The Catalyst 912 FireWire interface we developed for the award winning DualDisk hard drive is now integrated within MediaBank HS-R giving it another edge in terms of performance." Featuring two easily removable hard drive trays and hardware support for Raid 1 (mirroring), HS-R is the most secure FireWire storage solution available today. 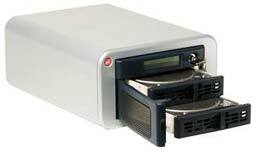 Data is written to two hard drives simultaneously, preventing total data loss if a drive were to fail. Hardware support for mirroring removes potential software conflicts and guarantees a faultless and automatic backup of your vital data. MediaBank HS-R ships with a spare hard drive tray, allowing you to keep a drive containing all your data in a secure location (automatic backup facility)! The Miglia HS-R is available now from Miglia's distribution partners, refurb or online store, for a recommended retail price of: £449, $449, Eu299. All prices are ex VAT. All units carry a full 2 year RTB warranty. A list of distributors and resellers is available on Miglia's website.